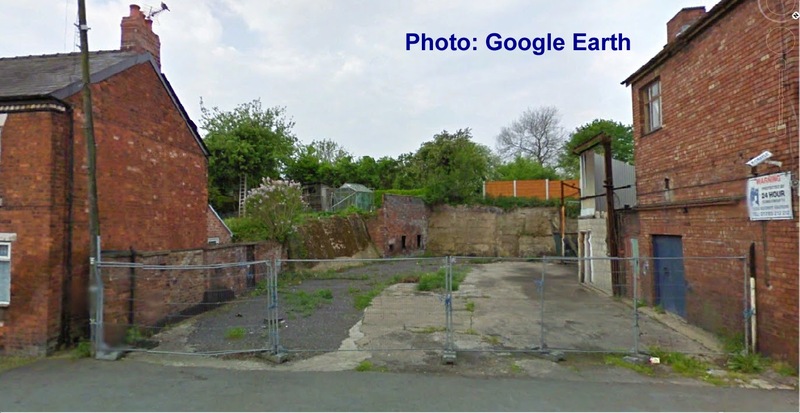 Following on from Malcolm Hough's early 20th century photograph of Lewin Street showing the long-lost Royal Oak public house, here's a modern snapshot, taken from Google Streetview, which shows the last remnants of the pub, demolished in the 1950s (? ), which are to be found at the rear of the site of Niddrie's bus garage, next to the famous toyshop which itself bit the dust in 2012. 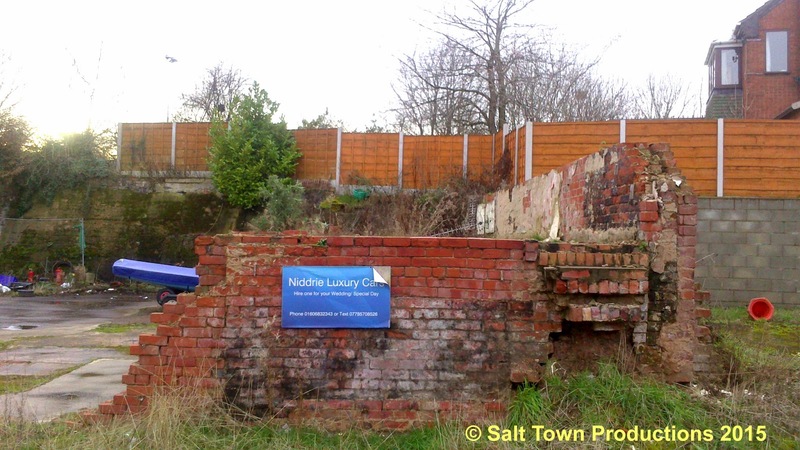 The last remains of the pub, according to Malcolm, who had the information from local resident Trevor Williams, are the walls in the middle of this shot, underneath the modern wooden fence. 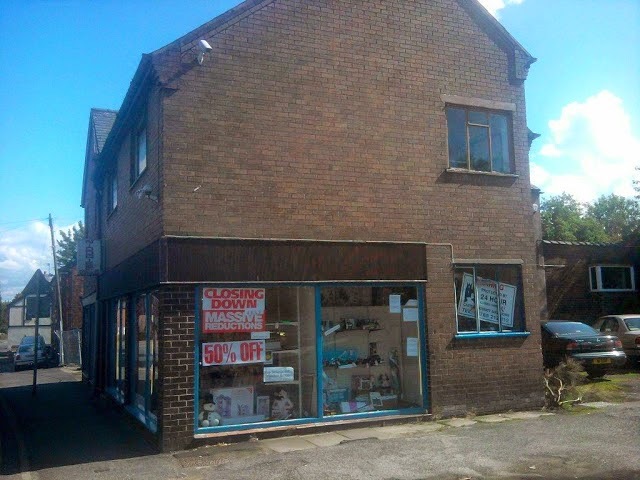 To the right is the left-hand wall of the toyshop, complete with security camera and signs warning that the premises were under 24 hour surveillance - a testament to the vandalism and crime which plagued the business in its final days. 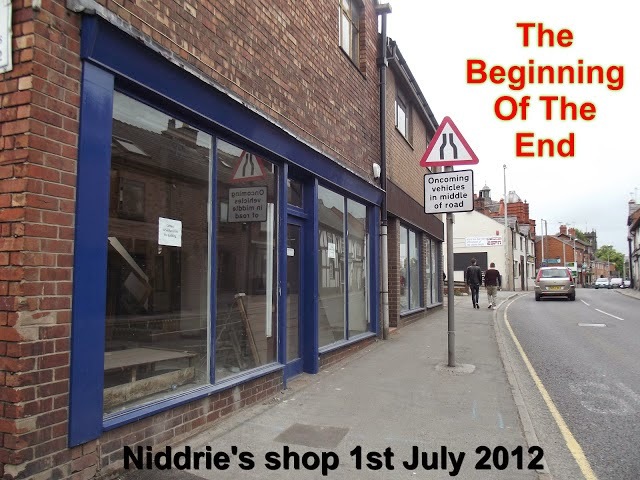 It is evident from these photos that Niddrie's actually consisted of two parts - an old part and a new part, the left hand side being older than the right hand , which, presumably, was the portion of the premises built in the 1950s. Beyond the old part of the building (out of shot to the left in the third photo) was the bus garage, the site of which is shown in our top photo. If the walls behind that garage were those of the Royal Oak, how do we fit that building into the space where Niddrie's was, and what was the 'old' part before it became part of Niddries? Was it part of the Royal Oak? Or was it built separately? Or was that the part built in the 1950s, to be followed later by an even 'newer' part? And where was the three storey house with the steep steps? Did that become part of Niddries in the 1950s? Or was it originally part of the Royal Oak? Malcolm Hough and Trevor Williams are of the opinion that the Royal Oak was demolished 'in the 1950s when Niddrie's was built'. Did part of it survive? How do we account for the whole space between the still extant houses, and the White Horse? To make the problem clearer here, again from Google Earth, is the entire site as it was in 2011 during Niddrie's closing down sale. As can be seen from Malcolm's early 20th Century picture, the Royal Oak was very close to the White Horse, which can be seen on the right, with, at most, a small alleyway between the two. If the wall underneath the modern wooden fence in this picture formed part of the Royal Oak it must have been a truly enormous building. My husband and I have been comparing notes. We both remember the house with the steep steps (and John Maddock, Bill) which we think was in the space to the left of The White Horse and was sideways on to the road. Neither of us remember any pub-like building and think it must have been demolished long before the 1950s. 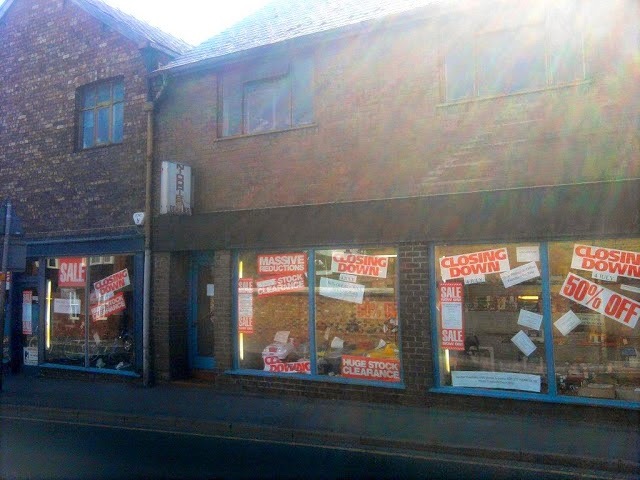 Whatever the truth of the matter, the site is in a sorry mess these days, after Niddries was rather unexpectedly demolished when it was, apparently, on the verge of becoming a plumbers shop. 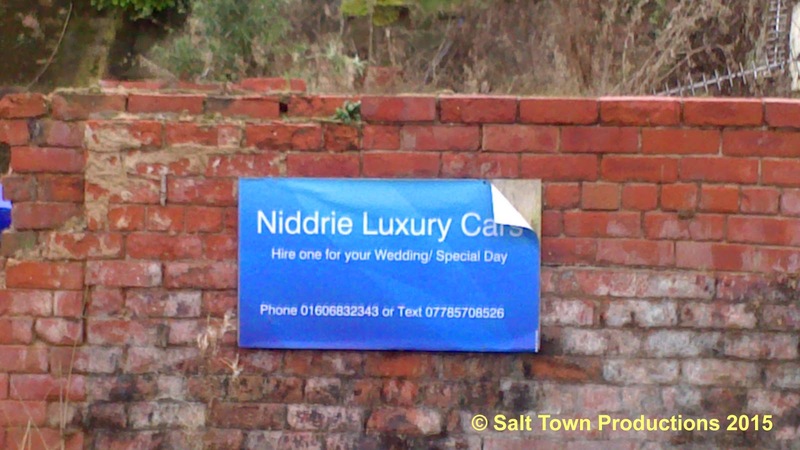 In 2015 one last reminder of Niddrie's remains on the site in the form of this advertisement for Philip's luxury car business. 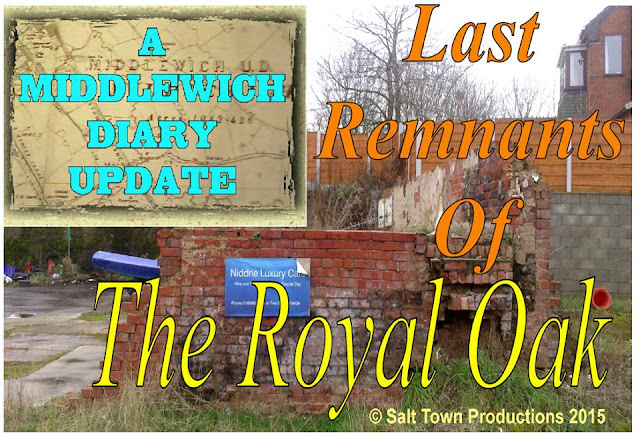 I was living in Middlewich in the forties and fifties and can't remember a pub called the Royal Oak. I do remember buying a bike from Niddries, it was a Raleigh, Black Panther tourer. It cost me 20 pounds, that was two weeks wages in the fifties.